A relatively last minute (understand that, by my standards, "last minute" can mean only a month of advanced planning) trip to Atlantic City was had by my wife and I this past week. Why Atlantic City? Well, I think I've written about this before, but I have this odd connection to "AC". As a child growing up in a rather modest setting financially, we really didn't go on all that many vacations. In fact, I think where only two that I can recall, both to Atlantic City (BG: Before Gambling). 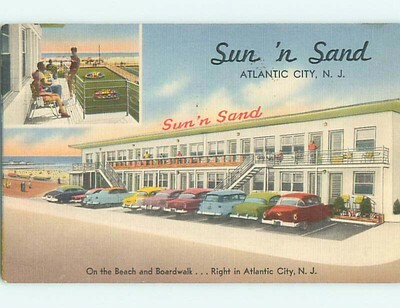 The AC of those days was a dingy but big beach town, kind of like Ocean City, MD, if it were older and more decayed. Never the less, those were my childhood vacations, and the fond memories are there, complete with rushing to the ocean with my three brothers for that first toe into the salt water. My wife, on the other hand, also has a something of a connection to the AC area. Her early years were spent with her family on a religious mission to the Dominican Republic. When that ended, the transition housing back to the United States was in Ventnor City, NJ. She tells me that it was there where she learned how to ride a bike. Both locations, namely the hotel where we stayed as a kid, and the transitional housing, are still standing. The Sun 'n Sand Motel, back in the 1950's. I actually own this postcard. In fact, I bought all of the old postcards I could find on eBay and turned two into a Christmas gift for my older brother Richard. Unlike what the postcard shows, the hotel didn't actually have a beach view. There's also some poetic license at work with building's exterior design. The same building, still standing, in Atlantic City, found during a morning bicycle ride. After a little bit of time searching with Google, we also found the transitional housing my wife (and her family) stayed in Ventnor City. I don't have a "before", but here is a "now" view. Interestingly enough, many houses in that area, such as the one immediately to the left of this photo, are in the process of being raised off of the ground. Outside of the history searching, we spent our time walking, eating good food, and enjoying the beach (for all of about two hours, as it as despicably hot outside). We also gambled a total of $35 on the slot machines, losing it all. For the record, I don't understand how they work or what constitutes winning. I also can't conceive of the allure behind gambling. Atlantic City is also a very interesting study in the failings of urban renewal, especially when that renewal is predicated boosting one specific industry (gambling) that offers little in the way of trickle-down economics to the masses. Casino Scape: The Revel Casino, completely empty (big blue building). Note the vacant lots. Urban Renewal, AC 2016: Mainly focused on tearing things down. There are many, many empty lots in the city. We stayed at the Claridge Hotel, next to Bally's. It's still got that "old AC" vibe that I remember from my childhood days. All told, it was a nice getaway, and my desire to relive a part of my childhood has once again been satisfied. For now.